Collecting monies owed to you can be frustrating particularly because the rules and regulations of collections are very confusing. Knowing what you can and cannot do when it comes to collections is an ever-changing business. We focus our Collections training courses and continuing education products on keeping you and your business compliant and more importantly out of the regulatory hot seat. 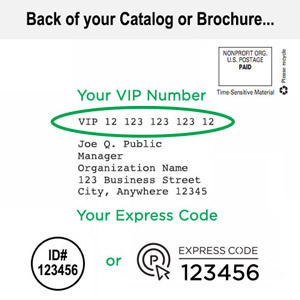 You are responsible for everything from repeatedly contacting (and tracking down) individuals and businesses that owe you money, to knowing when to take legal action, dealing with outside collection agencies, documenting procedures properly and — most importantly — staying in compliance with strict government guidelines. Don't just assume you're in compliance … be absolutely positive! Did you know even one harmless mistake could put you in violation of both state and federal laws and set you up for a costly, time-consuming legal battle? What you learn here will enable you to take a careful look at your organization’s collection policies and procedures, adjust them if necessary and ensure your collection practices are within the law at all times. You will become familiar with specific collection activities and practices that can put you in violation of the law. 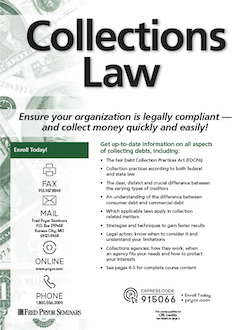 Managers, supervisors, vice-presidents and other professionals who work in any of the following areas will gain invaluable information from Collections Law: Collections, Accounting, Finance, Sales, Customer Service, Accounts Receivable, Small Business, Operations or Law. With the powerful skills, strategies and tools you’ll master here, you’ll find collecting money owed to you is faster, easier and less stressful than you ever thought possible.Most importantly, you’ll gain a clearer understanding of the legal particulars involved in the collection process, and never again make uninformed decisions that could place your organization under legal duress. Discover the truth about post-dated checks — is there ever a right time to accept one? When a bankruptcy is involved, can you still collect? Identify the most common violations of the FDCPA — are you guilty of any of these?